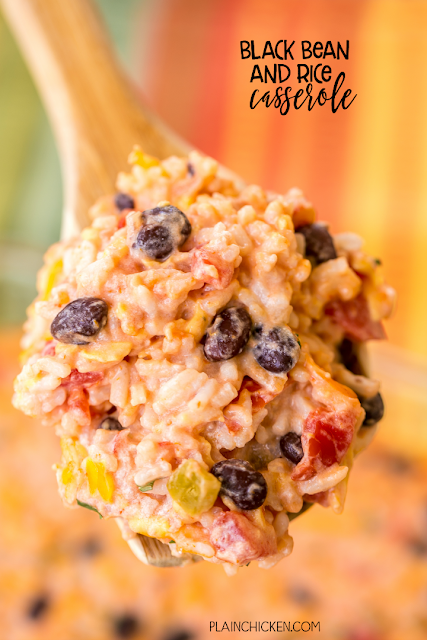 Black Bean and Rice Casserole - a quick and easy Mexican side dish! Can make ahead and refrigerate until ready to bake. Black beans, diced tomatoes and green chiles, tomato sauce, salsa, rice, sour cream and cheddar cheese. Makes a ton!!! Can serve as a side dish or meatless main dish. Also great served with chips for a dip. We LOVE this easy side dish recipe! I love Mexican food, but we rarely eat it out. I literally have ZERO self-control in the Mexican restaurant. I am knee deep in chips, salsa and queso before the main dish comes out. I eat way too much. I have to roll myself out of there! It also makes me super thirsty! I am drinking water for hours after I get home. SO much salt. It is safe to say that I have a love-hate relationship with Mexican restaurants. Since we usually eat our Mexican food at home, I am always on the hunt for recipes. This Black Bean and Rice Casserole is a new favorite. SO easy and it tastes great. You could even add some chicken or taco meat to the dish and have a full meal. 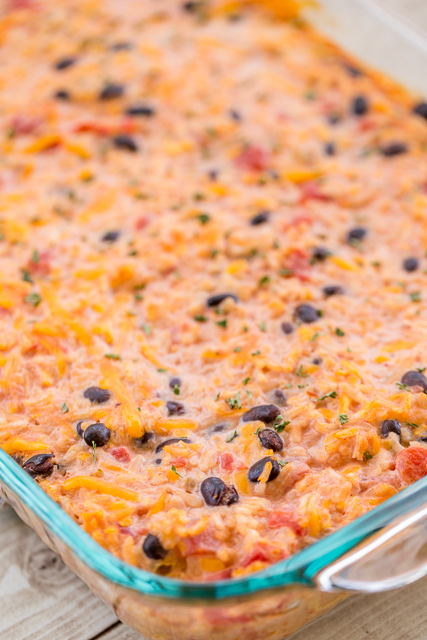 This Black Bean and Rice Casserole recipe makes a lot, so feel free to half the recipe or freeze half for later. This goes great with the grilled Taco Chicken recipe that I recently shared. It is also a favorite with tacos and fajitas! Heck, this would also be great served with chips as a dip. YUM! How long would I bake for if it was from frozen? I think it would be fine. Enjoy! Have you tried this recipe with chicken in it, as well? I haven't, but I think it would be fine with some cooked chicken added to the casserole. Does the rice need to absorb the liquid? I'm wondering if this would work with cauliflower rice?